Carta Jerusalem is sending me a review copy of this book when it is published next month. It is somewhat technical, but there are readers of our blog who have an interest in the subject. Carta is offering 25% off until January 31st only. 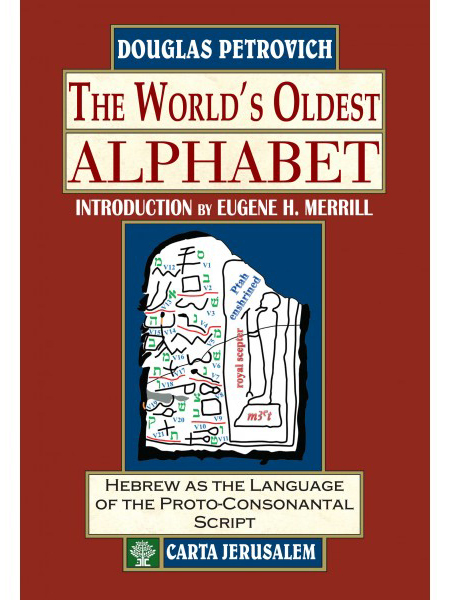 For about 150 years, scholars have attempted to identify the language of the world’s first alphabetic script, and to translate some of the inscriptions that use it. Until now, their attempts have accomplished little more than identifying most of the pictographic letters and translating a few of the Semitic words. With the publication of The World’s Oldest Alphabet, a new day has dawned. All of the disputed letters have been resolved, while the language has been identified conclusively as Hebrew, allowing for the translation of 16 inscriptions that date from 1842 to 1446 BC. It is the author’s reading that these inscriptions expressly name three biblical figures (Asenath, Ahisamach, and Moses) and greatly illuminate the earliest Israelite history in a way that no other book has achieved, apart from the Bible. Douglas Petrovich (Ph.D., M.A., Th.M., M.Div.) teaches Ancient Egypt at Wilfrid Laurier University (Waterloo, Canada). He formerly was the academic dean and a professor at Novosibirsk Biblical-Theological Seminary (Russia), as well as at Shepherds Theological Seminary (U.S.A.), where he taught all levels of biblical Hebrew. He earned a Ph.D. from the University of Toronto, with a major in Syro-Palestinian archaeology, a first minor in ancient Egyptian language, and a second minor in ancient Near Eastern religions. His research interests include biblical history and exegesis, Egyptology, and ancient Near Eastern history (including archaeology, epigraphy, chronology, and iconography). Petrovich has done extensive work in the area pertaining to the exodus and conquest. I have heard him speak on this subject at the annual meeting of the Near East Archaeological Society, and now I look forward to studying the book. This entry was posted in Archaeology, Bible Study, Biblical Studies, blog, Book Review, Books, Egypt, Israel, Old Testament, Travel and tagged Language. Bookmark the permalink. Hello. Can you tell me how you know this book is being released in February? I’d love to buy the book but I’m only going to buy it when it is released, or at least until I know when it’s going to be released. Thanks.